You are here: Home > T-Mobile to launch new, data-only Simple Choice plans for smartphones tomorrow? T-Mobile to launch new, data-only Simple Choice plans for smartphones tomorrow? A short while ago, one of our anonymous sources sent us the above screenshot showing some new Simple Choice plans Tmo is supposedly going to implement. Allegedly, they’re due to be released tomorrow. The only other additional information we have is that these are “data-only smartphone plans”. 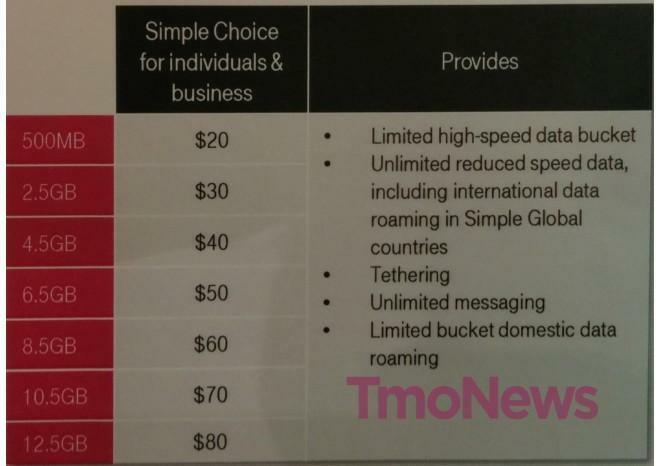 Currently, T-Mobile has a three-tier Simple Choice plan system for individuals. Each offers unlimited talk and text, but with different data allowances. $50 gets you 500MB, $60 gets you 2.5GB and $70 gets you unlimited. Under these new, data-only plans, presumably there is no talking included. “Unlimited messaging” in the chart would clearly suggest that texting is included (unless it’s crafty T&C marketing speak for “unlimited messaging through apps like WhatsApp/BBM”). The key thing here is that there’s a lot more variety in cost and data allowances. With 7 different tiers going upwards in increments of $10, there are plans from $20 to $80 with data allowances starting from 500MB to 12.5GB. Pricing and allowances are pretty much identical to the mobile internet plans currently on offer. If you – like me – are not one for talking, these could offer you a great deal more value for money than current plans. Each includes unlimited, international data (on EDGE/GPRS) and the data allowance includes tethering, providing your smartphone has that capability. We’ll find out soon enough is these plans are going to be announced. Hold on to your hats. They should offer a basic minutes bucket like 200 minutes for 15 bucks. And then they could keep the budget customer too. check out their prepaid plans, you can definitely do something like that. Can you do both at once, though? You can do the $30 100min/5GB plan and over fund it by $10 to get 200 minutes. Also, any unused portion of that extra $10 will get deducted from next month’s $30 if you’re on autopay. This is great new’s for a real affordable way to have mobile broadband on the go or for people who want a cheaper alternative for home broadband I know one friend that will sign up for this. Good point. That specific tier makes no sense on a cell phone when there’s an unlimited data option for $10/less. Maybe these plans were primarily designed for deaf people so as their usage increases they bump up their data tiers. Like the old Sidekick plans. Or maybe if tmobile gets rid of unlimited one day future plans would be modeled somewhat like this. Just data only, everything comes out of data including your calls. this + Magic Jack App = Win!!! it does look like they will eventually.., this above is showing it slowly.. cause it doesn’t make much since to choose 2.5GB over 5.. for the same price.. and that’s not including mins..
SimpleChoice is a postpaid plan, so if these plans work like the others, they would include unlimited (2G) international data roaming and limited (2G) domestic data roaming like all other postpaid plans, which the $30 prepaid plan does not. Presumably they’d also allow voice roaming at 10c/min or whatever the plan allows, another thing that prepaid does not allow. Doesn’t make much sense, why would they have a limited bucket plan which is more than the current unlimited plan which includes talk? Simple Choice was simple before… this could possibly be confusing to new customers. Why doesn’t T-Mobile simply add smartphone support over MBB especially the price is the same? Hate to crush this posting but these plans have been out for months on the business side. These plans basically just restrict voice. Pretty Simple. This looks exactly like my iPad data plan. Yes, it mentions texting. Looks like the only difference is they don’t offer the $10 discount for having a voice line. I’d like to see them add more data to the $30 prepaid plan. 30MB is nothing. Since I got a new phone (from Android 2.2 to Android 4.1) it seems to trickle all my data away. Settings are the same and I have minimal apps installed (and only update over wifi) I used to just scrape by and use data only when absolutely needed and would run out just around the 30 day mark. Now I have to shut off my mobile data or I run out after 2 weeks. It seems silly to upgrade my plan (and pay $20 more) when all I have is EDGE data in my area. I’d be happy if they would just make it 100MB and keep the 1500 talk/text as is. I don’t need unlimited. I’m not sure what plan you are on. But, I’m not the $30/mo pre-paid plan which has 100mins of voice, Unlimited Text and Data with 5GB of high-speed data. Ah wait, you get 1500mins of talk… that must be why. I barley use the phone and prefer the unlimited data plan. Yeah, so they can implement VoIP in hangouts for android. iOS already has it, but they say it’s a security risk on android because other apps can access it. I assume you can pay by the minute for talk on top of that right? 10 a minute probably? These are the exact plans for the deaf and hard of hearing; they’re just opening them up to all customers now. I don’t want unlimited voice unless it is the same price as 500 minutes per month. Any more would be a waste. These aren’t really “new”… Simply easier for representatives to access via internal systems. Previously these were the “deaf” plans which you had to call customer care and ask for (you didn’t have to provide any proof of disability). Basically this just makes it easier for reps to activate or move customers too – not a bad deal if you mainly use Facetime Audio Only or Google Voice VOIP. which is cool and all if you’re into prepaid, but these plans come with the EIP (phone payment) option. Do these come with tethering? If so, what is the tethering limit? But now they’re not just for deaf people unless you lie. You seem to misunderstand Alan’s comment. Let me rephrase. He agreed with you that these plans used to be for deaf people. Then he said that non-deaf people can get it if they lied to T-Mobile. The first part where he says “now” means that the he’s saying the new policy opens up these plans to everyone so non-deaf don’t have to lie about being deaf. Those are T-Mobile’s Current Mobile Internet plans for hotspots and tablets…I don’t believe the are going to be for smartphones. Do those existing plans also have unlimited messaging and international data? Why would I pay $70 for 10.5 GB of data only smartphone plan when I could get unlimited talk text and web for $70? Good question – unless you plan on doing A LOT of tethering… The unlimited (no throttle) data plan only gives you 2.5GB of tethering. Really? I just checked on my iPhone and it says I have to pay $10 extra so I can tether. I have the unlimited simple plan? That’s odd… as long as you are on the new Simple Choice Value plan – tethering is included for free on ALL the data packages. Without seeing your plan I couldn’t tell you any more – give customer care a shout or drop by your local store & double check. I’m surprised that T-Mobile came out with this first. AT&T has been discussing this for quite some time now. My Walmart plan beats this offering for my needs. But, I’m glad that carriers are realizing that not everyone wants to talk on their phones. Plans like this have existed for a long time… I’ve got one. T-Mo stopped showing them on the website years ago, however, so hopefully they’ll make these plans easier to find. Except those plans are supposedly only for deaf people unless you lie. Can the SIM with this plan be swapped among the phone, a notebook with a TMo compatible 3G/4G modem, hotspot and a 3G/4G tablet? good question. texting probably wouldnt work from a tablet. yes they do. i text from my tablet all the time when i cant find my phone or its dead. So half the data, none of the minutes, and the only gain is tethering from the $30/100/5GB plan of today. Wheres the benefit? A payment plan for the phone. Can anyone confirm this is working on an iPhone 4 (at&t) or working in general?